Pitts’ art is, indeed, often inspired: Bold, colorful and engaging, it invokes imagery of diverse people and sometimes uses dark/light contrasts or negative space to highlight the “hidden” figures within. Readers will enjoy searching for the many nuances in each picture. Unfortunately, the text is marred by copyediting inconsistencies and errors (i.e., “the Holy Spirit has a since [sic] of humor”). Awkward sentence structure can also be distracting (“This is a Christian man full of light in the jungle at night that appears to be injured…”), and some scriptures are transcribed with word and punctuation errors. 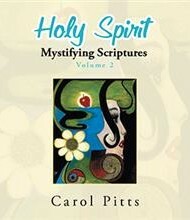 Overall, Pitts aims to provide a means of exploring the Bible and of receiving Holy Spirit-given revelations similar to those she has experienced. Despite the text’s need for greater polish, Christians looking for something unusual to stimulate their devotional time might enjoy this second offering of Holy Spirit Mystifying Scriptures.